I was thinking today about the origin of many super heroes. 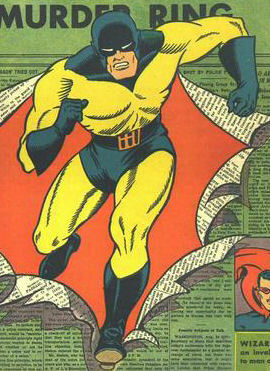 I’ve been spending the past few weeks going through the Public Domain Super Heroes site, culling it for bits and pieces that can go into the sample campaign setting I’m creating for Mystery Men! – little things like the names of newspapers, or other imaginary cities / countries / etc. I think I’m going to refer to the overarching setting as Wonderworld. Now, I’ve been planning to do a series of posts on many of these public domain heroes, including the ones that are going to be included in MM!, and one theme keeps coming up – people who should have been killed injecting themselves with serums, bathing themselves in radiation, falling into dynamos, instead pop up with super powers and fight crime in a largely imaginary world. NOD is based on a world of dreams, created from the fabric of tales told by writers ancient and modern. Maybe Wonderworld is a strange afterlife, visited by those who died in the real world with a deep-seated desire to do good. In this afterlife, Wonderworld, these lost souls find a way to live out their dreams. Perhaps people who have witnessed a loved one brutally murdered and crawled inside their own heads also roam freely in Wonderworld, meeting out vengeance. Of course, dreamers would be welcome as well. Wonderworld becomes a super-heroic version of NOD. With that in mind, here’s an A, B and C of people who should rightly be dead, but instead are fighting crime with powers far beyond those of mortal men. 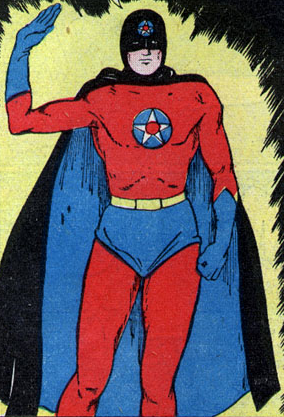 When Grand University astronomy professor Archibald Manning is bathed in radiation in an accident, he gains amazing powers and becomes a costumed crusader – the American Crusader, in fact. He pretends to be a meek pushover in real life to keep his secretary Jane Peters from discovering his secret identity. Newspaper cannot stop the fury of the Black Hood! Police officer Kip Burland of Northville, Canada is framed for a crime by the Skull. He is relieved from duty but pursues the Skull in an attempt to clear his name. Unfortunately, he is too successful in his investigations and is shot eight times by the Skull and his thugs and left for dead in the woods. The hermit of the woods finds Kip and not only saves him, but trains him to become a crime fighter. He takes on the guise of the Black Hood and manages to bring the Skull to justice and clear his name. Rejoining the police, he decides to continue to fight crime as the Black Hood. Gamma rays and infrared rays do not mix – important safety tip! Andrew Bryant is a young research scientist working for Pacific Electrical Corporation. 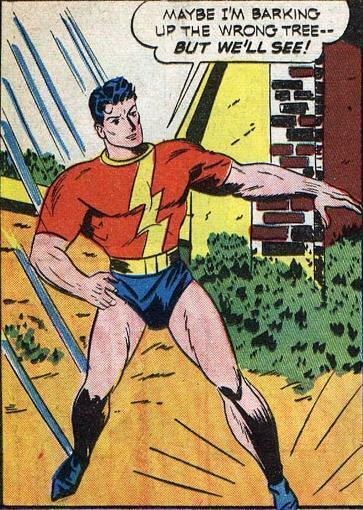 In an experiment, he crosses gamma rays and infrared rays and causes an explosion that grants him super powers. Taking the identity of Captain Future, he works with detective Grace Adams of the Agatha Detective Agency to fight crime in the Golden State. Cool! I really like the stat block design.